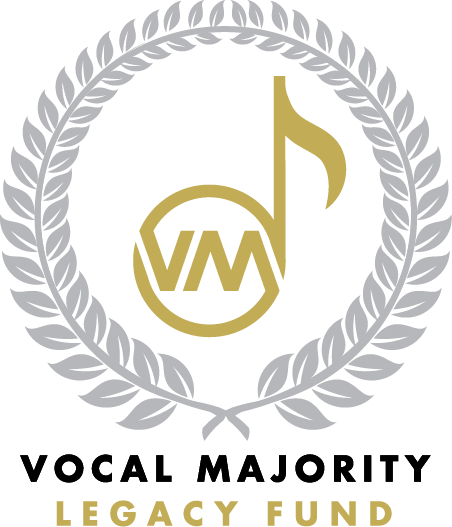 Individuals and corporations can support The Vocal Majority Chorus to help bring our beautiful music to the world. Come join our movement to inspire people of all ages, and from every background, to sing and make the world better, one song—one life—at a time. Your tax-deductible contribution to the Vocal Majority makes you a partner with us as we enrich lives of all ages. Your contribution to Vocal Majority supports the extraordinary work of the chorus as we provide scholarships to Harmony Explosion Camp, workshops for youth singers and many more musical enrichment activities. Because Vocal Majority is a 501(c)(3) not for profit corporation, your gifts are tax deductible in the year of the gift. You can become a friend of the chorus and join our movement with any level of contribution you choose under $100. If you wish to contribute at a higher financial level of $100 or more, you can become a member of our Inner Circle. For Inner Circle membership, you may contribute any month of the year and your contribution will remain active for one year to that month. To maintain active membership status, members must contribute on an annual basis. You can join us by making an annual tax-deductible gift at one of the following levels. Your name will appear in our Christmas and Spring Show program. We would love to visit with you to open a dialogue of partnership between your company and Vocal Majority! The Vocal Majority’s Inner Circle Legacy Fund provides an additional contribution option for those donors who wish their gifts to be permanently endowed. The Chorus spends no more than 5% per year of the Fund’s 3-year average value, as regulated by Texas’ Uniform Prudent Management of Institutional Funds Act. Your gift will reside in widely held, low-cost equity and fixed-income funds from one or more of the major American fund families. Donors can choose between two investment profiles…Capital Appreciation - for which the mix of equities to low-risk investments is dependent upon the current market conditions - or the more conservative Capital Preservation profile that will maintain a 60% / 40% equity-to-low-risk ratio. As part of the Inner Circle program, Legacy Fund donations are 100% tax deductible in the year of the gift. The minimum initial contribution is $4,000, to be fully funded during the calendar year of your pledge. Once you make your first donation, you may provide additional Legacy contributions of any amount, at any time in the future. The Chorus is pleased to announce that a generous internal donor will to match your Legacy donation 50 cents on the dollar. So your $4,000 gift becomes $6,000 of principal for the Chorus! Your donation will be given enduring recognition in the Chorus’s annual Spring and Christmas show programs. If you wish, you may use your gift to honor or remember a loved one. Your generosity will be commemorated long beyond your lifetime. We also offer a Planned Giving option for those who wish to pledge cash or marketable securities in the future, via a bequest or other means. By doing so you will also receive recognition in our show programs. Won’t you consider becoming a part of the Legacy Fund by making a contribution to support our work? Our matching program offers a unique opportunity. Just call 214-526-8686.